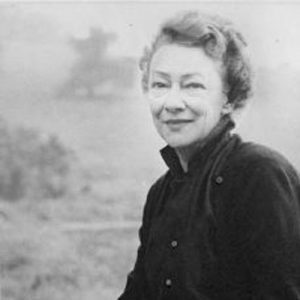 Kay Sage was a pivotal character in the avant garde on both sides of the Atlantic from the late 1930s onwards, primarily associated with the Surrealists, and with her husband, Yves Tanguy. Sage was instrumental in helping several members of the European avant garde to escape Europe around the beginning of the Second World War; these included Tanguy, whom she married shortly after his arrival in New York. One of a small number of Americans who had lived in Europe and spoke French, Sage helped facilitate the lives of the émigrés on their arrival in the States. Her works are featured in a number of museum collections, especially in the United States, for instance the Philadelphia Museum of Art, MoMA, New York and the Whitney Museum of American Art, New York. Sage is too often seen as the wife of Tanguy, rather than as an artist in her own right. Yet it was through her pictures that Tanguy came to meet her. He had seen six of her paintings exhibited at the Salon des Surindépendants in Paris in 1938 and had voiced his admiration of them—at that point, not knowing from her name whether she was male or female. A mutual friend, the sculptor Heinz Henghes, engineered an introduction between the pair shortly afterwards, and so began an intense and creative relationship. Looking at Sage’s pictures, which often feature mysterious architectonic objects littering a landscape that recalls Tanguy’s own seascapes and mindscapes, a number of people have drawn conclusions about her husband’s influence on her work. In fact, much of this crossover is due to shared artistic DNA: they had both been struck by pictures by the great doyen of Pittura Metafisica, Giorgio de Chirico. It is to him that Sage owes much of the appearance of her pictures. Yet they surpass those origins, becoming rigid yet oneiric, images of mechanical parts held in impossible stillness in some other timeless dimension. Sage’s love of art had become apparent early in her life. Born into a wealthy and respectable American family, she accompanied her mother to Europe after her parents divorced, living in Rapallo, Rome and Paris and becoming immersed in European culture. She returned to the United States to study at the Corcoran School of Art in Washington, DC; later, she married an Italian socialite and lived a number of years of indolent internationalism, a move that she felt stifled her creativity. She separated from her husband in the mid-1930s and soon found her inspiration. She had her first exhibition at Milan’s famous Galleria Il Milione in 1936, and moved to Paris the following year. There, she was struck by the work she saw at the Exposition Internationale du Surréalisme of 1938, not least the works of Tanguy. At the outbreak of war, Sage was in New York and helped to arrange for Tanguy to have an exhibition at the gallery of his old school friend Pierre Matisse—the son of the famous painter. Sage herself had a show there shortly afterwards. Within a short amount of time, the couple married in Reno and then moved to Woodbury, Connecticut, where they were near a number of important personalities of the day: the Calders, Arshile Gorky, André Masson and Julien Levy all lived in close proximity. Sage’s paintings became increasingly assured during this time.